Last time I went to my local pen shop, Platts of Preston, I noticed that they started selling pens from ONLINE, a German pen manufacturer. Unfortunately the shop sold only ballpoint pens from ONLINE and the owner told me that he cannot get ONLINE’s mechanical pencils and fountain pens. These ballpoint pens made me aware of ONLINE’s (relatively) new Top.Line range, which was introduced in 2006. ONLINE is a fairly new manufacturer of pens, established in 1991 and focussing on “design-oriented writing instruments for students”. Even though the headquarters are in Neumarkt, in the Upper Palatinate region of Bavaria, it is next to Franconia (previously mentioned in the Eisen 402 post), only about 30 miles southeast of the headquarters of Staedtler, Faber-Castell, Schwan-STABILO and Lyra. In my opinion ONLINE is not a very good name for any kind of company as it creates confusion and makes searching for information difficult, but I can also see the pun (“on line”), related to pens if that was intended, and I can see that in the early Nineties the word “online” might have sounded extremely modern, representing a modern image for the targeted potential customers: students. Last time I bought pens from ONLINE was in the Nineties. I liked the concept of the pens I bought back then: Rollerballs that can be refilled with standard ink cartridges, but after a few days of use the paint of some of the plastic parts started to wear off. A few years later I left Germany and went to the UK and in nearly ten years I have never seen ONLINE pens in any shop in the UK. The UK is not listed on ONLINE’s retailer web page, so I assume ONLINE pens are still not officially available here, but are imported by a distributor (who seems to import ballpoint pens from the Top.Line range only). There are about 20 countries, including the USA, where pens from ONLINE seem to be available. As mechanical pencils from ONLINE are not available in the UK I asked my mother to buy me one and send it. 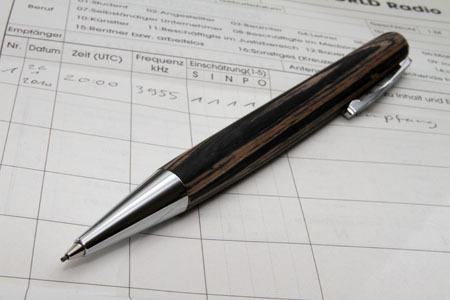 It was bought from Schreibwarengeschäft Buntstift in Volkach, Germany and is the All Wood Marone mechanical pencil from the Business Line range, which is part of the Top.Line Collection 2009. Every year ONLINE seems to launch a new Top.Line collection and Young.Line collection. The pens from the Young.Line collection are made in Germany. I did contact ONLINE to find out where the pens from the Top.Line collection are manufactured, but unfortunately I did not receive a reply. Both, the Marone and the Nero version of the All Wood ballpen and mechanical pencil seem to be made using Wawa wood. I paid just under € 30 (42 US$, 26 GBP) for the Marone version of the mechanical pencil. It takes 0.9mm leads and the propelling mechanism is twist-based: turning the head of the pencil 120° will unlock the lead and advance it. Turning the head back will lock the lead again, so that you can write. 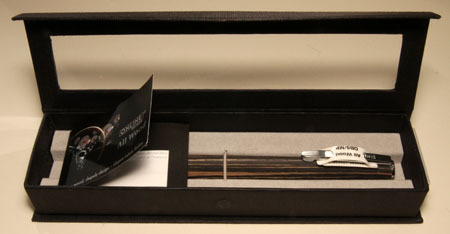 Unlike most ratchet-based penils the All Wood there is no button that can be removed, which means that there is no eraser and if you want to refill the All Wood you have to twist the head and insert the leads through the conical sleeve. The clip is spring loaded, similar to the clip of the Lamy 2000 (reviewed at Dave’s Mechanical Pencils). The head of the All Wood is a bit wobbly, in its locked state more so than in the unlocked state. Even though I find this a bit annoying this does actually not make a difference when you are writing, as your fingers are holding the pencil’s head. Altogether a fantastic looking pen. Personally I prefer ratchet-based pencils or at least pencils with some form of built-in eraser, but the Wawa wood looks so good that it compensates for all the shortcomings (wobbly, no eraser) of this pencil. Interesting post. I don’t recall hearing of ONLINE before. Wawa wood – now there’s a name! Thanks, Kiwi-d. Wawa wood sounds like a made-up name, but it is easier to remember than Triplochiton scleroxylon 🙂 The colours and the grain look fantastic. I wonder whether it is all natural or somehow enhanced using a special kind of treatment.